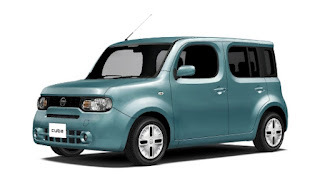 Nissan's Cube is a mini-MPV that wins no points for its aerodynamic design: Like the name suggests, it is both stubby and boxy. Its drag coefficient Cd=0.35 puts it squarely in the SUV category (compare with Cd=0.24 for the sleek Tesla Model S). But it is exactly that shape, so defiantly different, that distinguishes it from the rest of the pack. You can spot a Cube from a mile away. The tall boxy shape makes it great for stowing things you need to move around. A cello fits easily across its width, behind the back row of seats. American parents report being unable to fit three child seats on the back row, because American child seats are very wide. On the other hand, you can fit an unfolded child stroller in the back. And (without children in the car) the back seats can be folded down to make a large cargo space; access is easy because the thresholdless rear opening. About the rear opening: apart from the asymmetry (another distinctive feature), it's enough to make vertically challenged people like me sigh with contentment: If it opened upward like a hatchback, I would have to jump to get at the open door every time I need to close it. Good exercise, but I bet it gets old really fast. As it is, the rear opens like a refrigerator door (one wide refrigerator): a toddler could push it closed. The rear door is thoughtfully hinged on the left side, with the handle on the right side close to the curb. So if you park on the right side of the street you can open the rear door from the curb side. This is thoughtful, because it is not how the Cube was born: the engineers who designed it made it for Japanese drivers, who drive on the left side of the road. 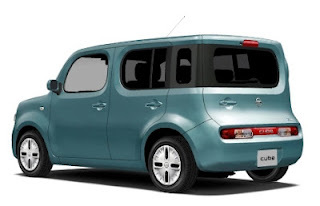 Sure enough, if you look for the Cube on Nissan's Japanese website, you will find that Japanese Cubes are the mirror image of the ones you find here in the U.S.: steering wheel on the right, and rear door handle on the left. And the rear window wraps on the left. It's the kind of attention to detail that makes a model fly on any continent. It is perhaps the Japanese love of water gardens that inspired the relief on the ceiling, which resembles the water surface when a hit by a single drop of water. I would find it disconcerting to have a feature like that, but inverted and hanging over my head. Instead I would much prefer the glorious sunroof, edges curved to follow the wave pattern of the dashboard (the sunroof is not available in the U.S. because of cage construction rules). 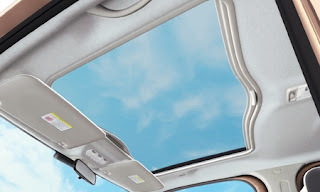 The sunroof is big and lets in plenty of light and warmth. Of course, the warmth can quickly turn to uncomfortable heat in Japan's sticky summers. 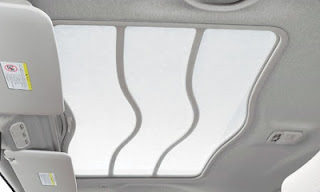 As with most sunroofs, you can reach up between the front sun visors and pull back a cover that blocks both heat and light. 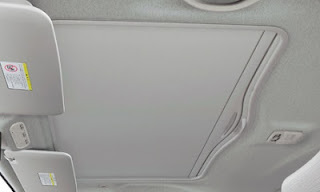 If you want the light but not the heat, there is an option, intensely Japanese, of pulling a shoji screen over the sunroof, which is stowed in the ceiling space just behind the sunroof. I doubt that the screen in actually make of rice paper, but if this feature were available in the U.S. I would jump at it! It is becoming increasingly popular in Japan, where the elderly make up a large part of the population, to equip a car with a swivel chair on the passenger side, for increased mobility for people who would find it difficult to climb in and out of a car otherwise. (Click on the picture below to the page demonstrating how the chair swivels out and down to street level). Certainly the cargo space behind the back row of seats is large enough to hold a folded wheelchair. In addition, there is an optional wheelchair ramp that allows for a wheelchair with passenger to enter the car via the rear door. For the younger generations, the Cube comes optionally jam-packed with such conceits as USB connection, iPod interface, satellite radio and other distracting technologies. Of course, the U.S. version comes only with a 1.8L engine that I estimate will do 29 mpg on average for manual transmission, while the Japanese version gets a 1.5L engine that gets 38-40 mpg (my estimate) even though in Japan the Cube only comes with automatic transmission (as far as I can decipher the specs). Avg. actual 29 mpg est. 38-40 mpg est. Cool review (and cool car), and yours is the very first place I've stumbled into a Cube used for handicap access. With aging Boomers, you'd think the manufacturers would jump on this market, but it all seems to be aftermarket conversions, and driven by the commercial Medicar fleets. My 90+ Mom has been having more mobility problems due to lousy leg circulation over the last few years, and she just had a leg amputation. We're not sure, but it looks like fulltime wheelchair use is likely. I've become interested in the wheelchair-ramp vehicle market lately, if not obsessed with 'em. At first I thought I could find a big-door/low floor wagon of some type, then bolt in a folding ramp myself... but as near as I can tell, there's no such animal. A lot of wagons seem to have a low door, but their floors are a few inches higher; some of the big sliding doors leave hinges hanging in the opening. Transit Connects and Caravans have a floor about 18" oof the ground... that would call for an EIGHTEEN-FOOT ramp at the 1" ramp-rise-per-foot standard! I really like the idea of a minimalist little wagon, especially if it's sporty as well. I've seen Kia Soul and ScionxB conversions on the GoogleNet, but not in real life near Chicago. These conversions almost double the price of a modest little vehicle. I wish Nissan promoted this idea locally, seeing as how the gear already exists. I hope they have a similar package for the new NV200 minivan, and I hope Ford considers the same for their '14 Transit Connect mini. The typical Caravan conversion has a lowered floor, and is therefore jacked up for ground clearance. The latest ones have efficient Pentastar motors and six-speed trannies, but they still weigh around two tons. It might be easy to load (and still a big-cargo utility box on the side), but it can't be fun in a crosswind, or rolling around in the snow. I am sorry to hear about your mom; I hope she will be okay, and that you find a good transportation solution for her! Truthfully, I doubt that Nissan will ever market their "SlopeType" access ramp in the US; our safety requirements are draconian, and if you look at how they tether the wheelchair you can see this system won't stand a chance here: http://lv.nissan.co.jp/LVCAR/CUBE/SLOPETYP/index.html . My guess is that it is liability issues that makes conversions so very expensive.